We can only speculate about a parallel universe in which Joseph Makwela never bought an electric bass off Mannie Parkes (see the Mavuthela story at matsuli) or where Robert Bopape at Mavuthela Productions never introduced Marks Mankwane to Joseph and the other band members that were to solidify the foundations of mbaqanga as the Makhona Tsohle Band. But enough speculation...by the late sixties the formula had been laid and "vocal jive" (we like to call it electric jive) was the modern urban sound of NOW. Its not surprising that the female band to challenge the crown of the Mahotella Queens and the Dark City Sisters was Izintombi Zesi Manje Manje - literally "the NOW NOW GIRLS". 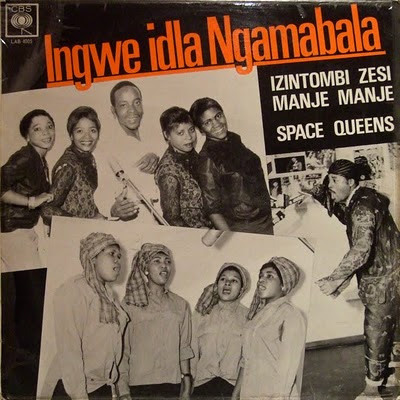 Other girl groups heralding the new were the S'modern Girls, the Queue Sisters, the Manzini Girls, the Flying Jazz Queens, Mgababa Queens and the Space Queens amongst others. 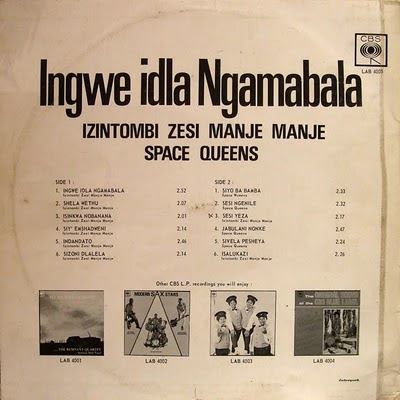 And so today...one serious dose of electric jive from Izinthombi Zesi Manje Manje and the Space Queens. If you wish to purchase the CD compiling their greatest hits then you can buy the Best of Izintombi Zese Manje Manje from Kalahari.net for ZAR40.00. This release was re-mastered as part of Rob Alingham’s work whilst at Gallo Archives. Louise Meintjies has also written extensively on Izinthombi Zesi Manje Manje in her fascinating book Making Music Zulu. More details via AMAZON. ...I've noticed that rapidshare are making things increasingly difficult for free users to download - other comments around the blogs seem to confirm this, and some sites have given up on rapidshare altogether and now use mediafire or other alternatives. Have any other bloggers noticed this?? Guys, bear with us. Rapidshare seems to be a hot and cold thing, like marmite. Some people have no issues whilst others seem to have constant problems.